Fill out the form to learn more about how Ramsey Education can help you. What students do you primarily work with? Thank you for contacting Ramsey Education! Your message is important to us. We will reply to you within 24 hours Monday - Friday. We look forward to serving you! Foundations in Personal Finance: Middle School Edition has been taught in all 50 states. This supplemental curriculum consists of six stand-alone chapters featuring 22 lessons, which weave together humor and real-life stories to educate and reinforce sound principles for managing money. See how this curriculum aligns with your state standards. Try it in your classroom today — for free! Enter your email to download curriculum samples. Fill out the form to request a demo of FoundationsDigital. Thank you for your request! Please check your inbox for a link to your FoundationsDigital demo account. Fill out the form to request a copy of our Review Copy. Thank you for contacting Ramsey Education. Your request has been received. Our team will be in touch shortly. Introduces personal finance concepts; explores what it means to be smart with money; emphasizes three reasons to save money; compares simple interest and compound interest; explains the purpose of a budget; identifies the difference between debit and credit cards; explores how to talk about money and money goals; and highlights the importance and benefits of giving and serving others. Identifies terms associated with debt; evaluates the financial impact of debt on a household budget; examines the elements of a credit report and credit score; highlights the importance of avoiding debt; identifies ways to stay out of debt; explores the cost of a college education and the long-term cost of student loan debt; and explains ways to pay for college without going into debt. Explains the difference between saving and investing; introduces investing as a way to build wealth; highlights the impact of compound interest and introduces the time-value of money; explores different types of investments; identifies different types of insurance; examines the impact of and problems associated with identity theft; and examines ways to protect yourself from identity theft. Explains the differences between various economic systems; examines the movement of goods and services; explores supply and demand; explains the chain of production and gross domestic product; highlights the differences between developed and developing countries; explores global economics and trade matters; and examines the impact of scarcity and rationing. Introduces consumerism and spending habits; explores the impact of marketing, product placement, and peer pressure on consumer behavior; explains the concept of economic incentives; compares contentment and discontentment in regard to consumerism; explores various consumer protection agencies and laws; and identifies ways to be a wise consumer. Foundations in Personal Finance: Middle School Edition meets or exceeds state standards in all 50 states and meets all national standards for personal finance. Select your state from the dropdown menu above. You asked, we answered. Here are some of our most frequently asked questions about Foundations in Personal Finance: Middle School Edition. 1. How long does it take to teach Foundations in Personal Finance: Middle School Edition? 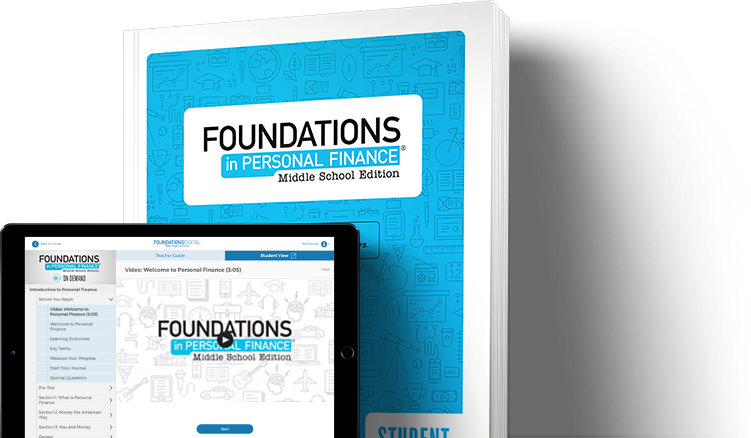 Foundations in Personal Finance: Middle School Edition is a supplemental curriculum that comes with a 6-week, 9-week, and 18-week syllabus. If you were to teach this 5 days a week in 50-minute class periods, you could finish the course in 6 weeks. And like our high school curriculum, these chapters are stand-alone and flexible enough to fit around YOUR schedule and not the other way around. 2. What's included in the Foundations in Personal Finance: Middle School Edition Digital Teacher's Edition? The Digital Teacher's Edition includes all of the ready-made lesson plans, learning activities, assessments and case studies designed for use with the video and chapter lessons. All of the resources in the Teacher's Edition are in PDF format, so they're easy for you to print off and use on a daily basis. 3. Is there a digital option for Foundations in Personal Finance: Middle School Edition? While there's not a fully digital option for the middle school edition yet, we do have a blended format of this curriculum that includes streaming videos and online activities available through our FoundationsDigital platform. For more information or a quote, please contact your Curriculum Advisor. 4. I can't afford Foundations in Personal Finance. Are there other options? At Ramsey Education, we have an entire team here to help schools find sponsors who are also passionate about financial education in schools! 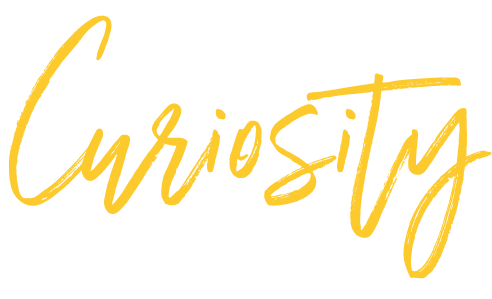 If you are interested in teaching the curriculum and funding is your only obstacle, please fill out a Sponsorship Request form, and our team will be thrilled to begin looking for a local sponsor so that you can use the resources at no cost. 5. What is On Demand Video? On Demand Video is an exciting Foundations feature that allows teachers and students to access the curriculum videos anytime, anywhere, using any device with a modern browser. It's a great for flipped instruction, absent students, and parent involvement. 6. Do I need training or certification to teach Foundations in Personal Finance? Foundations in Personal Finance is easy to implement and fully turnkey. No additional training or expertise is needed on your part. 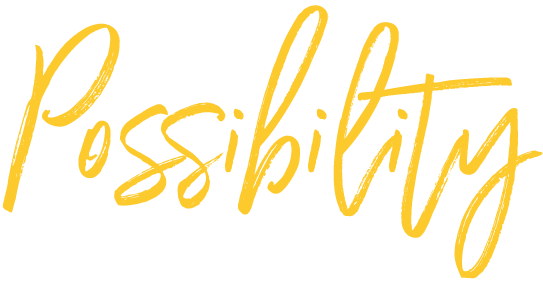 Your district may require training, but most Foundations teachers tell us that they learn right along with their students as they listen to Dave Ramsey and his team of experts featured in the chapter videos. 7. How much does Foundations in Personal Finance cost? We offer both print and digital formats, and the cost varies depending on the number of students enrolled in your classes. To receive a customized quote for your classroom, please complete the Quote Request form or contact your state's Curriculum Advisor. 8. How many schools use Foundations in Personal Finance? More than 12,000 public and private schools across the country have used the Foundations curriculum. This means more than 4 million students have learned how to budget, save, spend wisely, invest. It's a generation equipped to live out their dreams and give to the world around them. 9. Does Foundations in Personal Finance meet state and national standards? Our curriculum aligns with both state and national standards for personal financial literacy. We also align with a variety of economics and entrepreneurship standards. You can view your state standards correlations or talk with a Curriculum Advisor for more information. 10. Is Foundations in Personal Finance appropriate for a public school classroom? Yes! Foundations in Personal Finance meets constitutional guidelines for use in public schools. The curriculum is textbook adopted in seven states, and it has been used by more than 12,000 schools nationwide with the vast majority of those being public schools. Our Sponsorship team is committed to finding local businesses to help schools like yours. Please know that the amount of information you provide on this form will directly impact our ability to find a sponsor for you. Which type of materials do you prefer to use? How many students would go through the curriculum (per year)? List any businesses in your community that you think might be interested in sponsoring you. Please share with us why you need a sponsor. How do you believe that this curriculum will impact your students' lives? If you've previously used Foundations in Personal Finance, please include real stories of life-change your students have experienced. 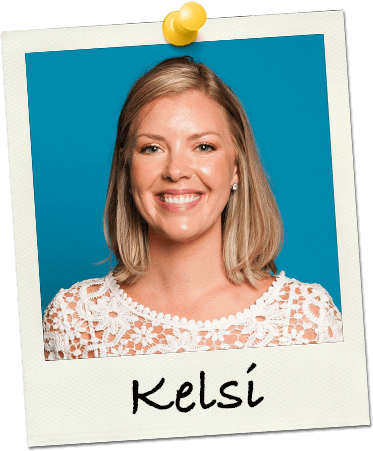 "This curriculum has begun to open my students' eyes to the world of personal finance. It has proven very useful to introduce students to a subject that will so personally impact their lives."